One of the oddest movies of 1984 is this fantasy film from Wolfgang Peterson based on a book by Michael Ende. There were significant enough changes in the story that Ende refused a title credit and at one point sued to have production halted. Although the author of the book was not enamored of the film, worldwide audiences ended up making it a good sized hit. The story, the visualization of the characters and the odd tone of the film contribute to it’s uniqueness. Fantasy films often have such a distinct look to them that people may be put off from them. I personally have not delved deeply into the animation from Japan as much as I think I ought to have, because the characters always look so strange and the dialogue and story lines seem off kilter. This is not a criticism, merely an explanation of why I have been tentative in this area. Don’t ask me to explain why I am OK with “Legend”, Labyrinth” or “The Dark Crystal”. They are equally odd but never gave me the same vibe. Bastian, a young boy who has lost his mother, and whose father is trying to center him, is also being bullied by schoolmates. Seeking refuge in an old bookstore, he comes across a cantankerous proprietor, whom it appears knows more about what Bastian needs than anyone who has met him before. As a kid, I was not bullied any more the the next guy, but I was a reader and this is how Bastian connects to me, and I think all those others who have followed his story. When overwhelmed, he find solace in the adventure books that allow him to live out a fantasy life. The book he has taken possession of however is special. You don’t just read it, you live it. Very much like “The Polar Express”, this book is about the death of imagination. It is more sophisticated and there are several cynical moments because a fantasy world depends on the imagination of humans, and it seems we have none. The encroaching destruction of the magical realm of Fantasia, is due to the Nothing. What better description is there of the human mind without imagination than that? The Nothing is personified by it’s servant, the wolf-like Gmork. It is Gmork’s task to hunt down and destroy Atreyu, the boy warrior sent to find a cure for the Empress so that she can stop The Nothing. I know I showed this movie to my kids when they were very young, believing that it is an intelligent fairytale. It only occurs to me now, that my oldest daughter, who can take Zombie movies and slasher films without any trouble but is truly frightened and creeped out by werewolf films, may have some bad childhood memories because of the frightening visage of this character. It’s tireless pursuit of Atreyu is shown several times in the movie, and often all we see are the glowing green eyes of Gmork in the darkness. Kids can be pretty impressionable and parents are sometimes clueless about that. Every time I see some kid in a film that is not really age appropriate, I wonder if there will be consequences. They may be small ones but I suspect that kids will in fact be impacted in ways we can’t always foresee. It might be a good idea to question some of your choices. I guess I’m a little late on that front. 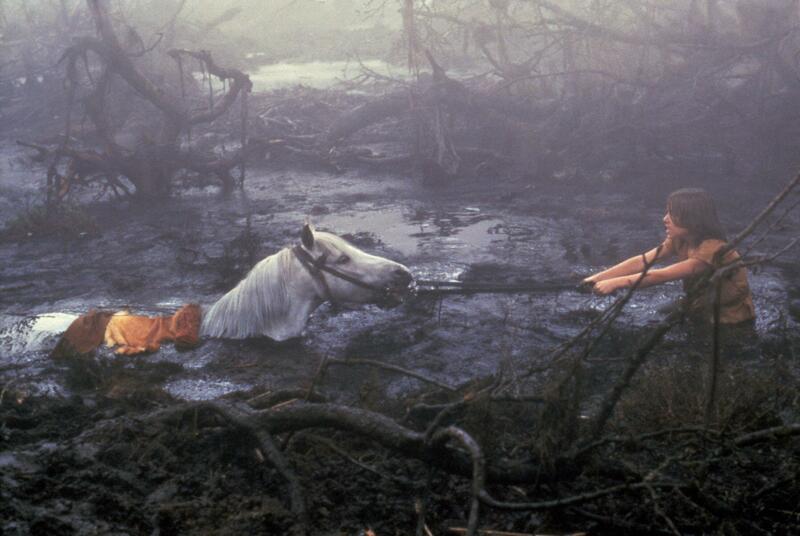 The one scene that both my kids remembered, even many years after they had last seen the film was the loss of Atreyu’s faithful horse Artax. In the swamp of sadness, one overcome by a loss of hope may be swallowed up. As they travel through the swamp, the unthinkable happens. Children’s stories are often full of tragedy and animals often carry the burden of our sadness. My kids are great at projecting themselves into a story and living the emotions that the characters go through. When my youngest daughter read Lord of the Rings in high school, she came out of her room in tears after the chapter where Gandalf fell in Moria. Tonight, as I was watching this movie, she was in the middle of scaring herself by reading Michael Criteon’s Jurassic Park. She looked up from her book at one point and asked me, “is this the scene coming up?” She has not seen this movie in at least fifteen years but she knew what horror was before us, and as we watched poor Artax give up I could see tears in the eyes of a grown woman as she went back to her book. The story is episodic as fantasy tales are wont to be. As each goal or objective is reached, a new one is set before the hero. Every incident brings in new imaginative characters that are visualized in the mind of the reader. That is the point of the story. Even though there is a description of everything on the page, the reader is the one who brings those images to life. So Bastian is the one who is providing us with the inspiring Luck Dragon Falkor, and the grim skies of the Nothing. It is the power of Bastian’s imagination that can destroy Fantasia or save it. There are all sorts of characters that are depending on the imagination of a bullied little boy as he reads their story. 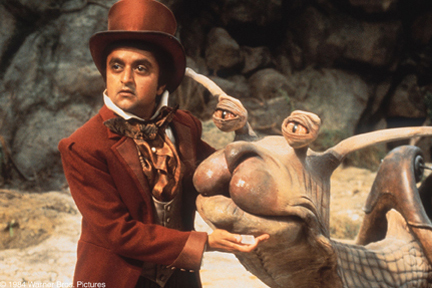 Deep Roy, who seems to be in all of Tim Burton’s films lately, and is currently Scotty’s diminutive sidekick in the rebooted Star Trek series, appears here as a Teeny Weeny rider of a magical racing snail. There is also a fantastically realized stone giant known as the Rockbiter, who is part of the strange group of characters that Bastian has to choose to save. None of these characters are part of the plot. They are background to what the main part of the story is. They represent the imagination of the reader. The film makers however did not limit themselves to fictional creatures from a privately created fantasy land. 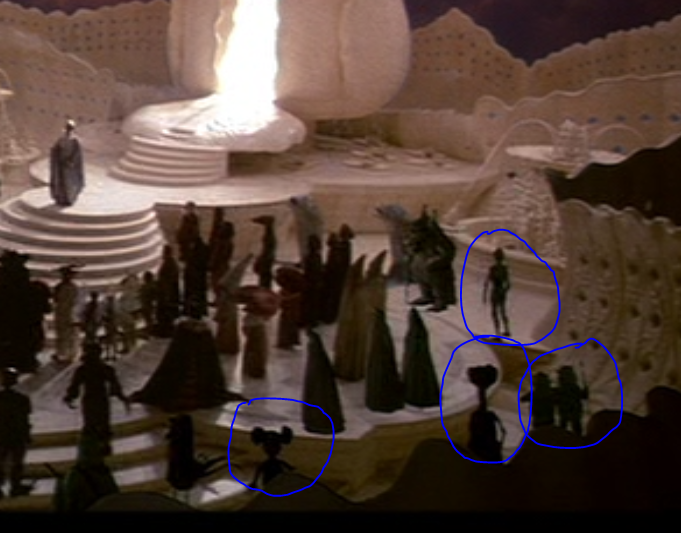 When Atreyu first appears at a gathering of the citizens of Fantasia, some of the special effects crew, who had worked on more recent stories, contributed some foreground characters that you might be able to pick out. Here you can see outlined, Mickey Mouse, E.T., Ewoks and C-3PO. So movie fans better hope that Bastian can save Fantasia as well. The twist of the story is that Bastian becomes the hero, replacing Atreyu in the task of saving the Empress. When all hope appears to be lost, Atreyu and Falkor locate the Ivory Tower (another literary reference) and learn that they have brought along the human child that they needed but could not find. It is the power of the book and the imagination that gives Bastian the opportunity to participate in the story. It does take some imagination for the film to work. The design was spectacular and when location shots were combined with photo effects, the movie usually works pretty well. The Rockbiter rides up on a giant stone bicycle and joins the other fantasy characters in a moment that takes place with traveling mattes inserted into photo effects and combined with costumes, props and makeup. The one effect that looks a bit labored is the Luck Dragon himself. An animatronic head is combined with an elaborate prop body but the actions feel very limited and the character does not really come to life. It takes all of the other actors efforts and some humorous dialogue to make us care about Falkor. And since Falkor has no wings, I wondered the whole time he is flying, how he manages to do that. The effects in the movie could certainly be stronger but for the time and for the purpose of this story they were wondrous. 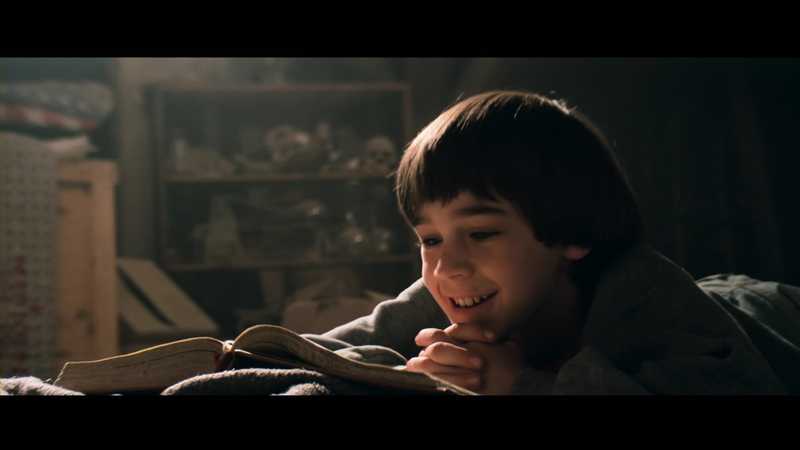 Any movie that encourages reading as a habit and shows us the power of imagination, has something to recommend it for. 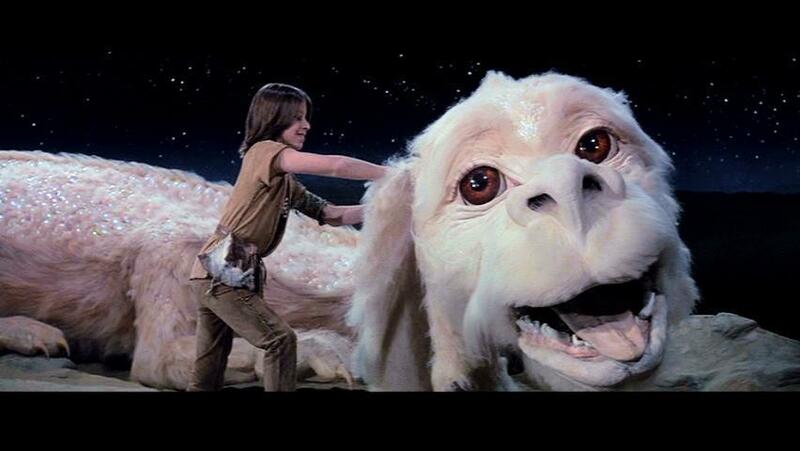 “The Neverending Story” unsurprisingly had a couple of sequels that I never saw. As the story in this film finished, I felt complete in what I had seen and did not feel more would add to my appreciation. If any of you readers out there saw the other movies and would care to elaborate, please feel free to tell us how you felt. For me, I felt like Bastian, moved by the story and compelled to keep reading as far as my imagination would take me. 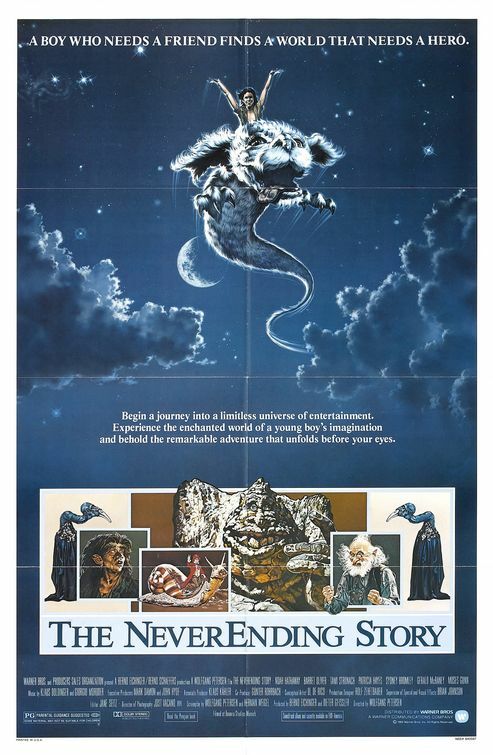 This entry was posted in Films and tagged Atreyu, Bastian, Fantasy, Luck Dragon Falkor, Michael Ende, The Dark Crystal, The Neverending Story, Wolfgan Peterson by 70srichard. Bookmark the permalink. Wonderful review. I have an interesting history with this movie. 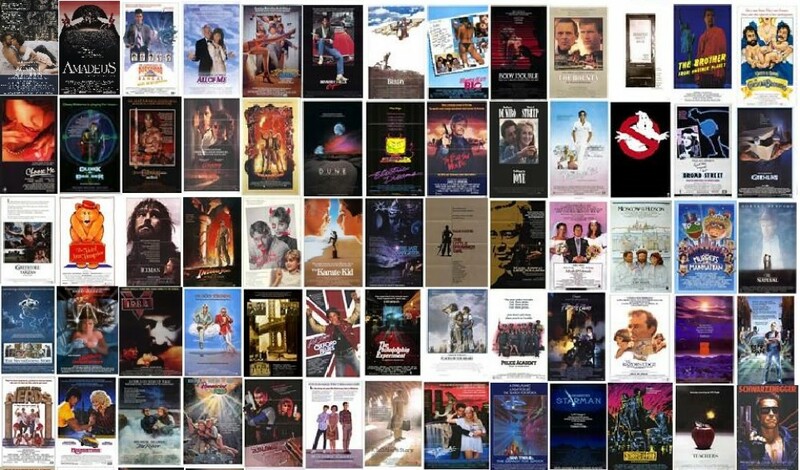 Growing up I couldn’t stand the film but my little brother loved it. It was on at our home all the time. I haven’t seen it since then (which is a looong time ago) and I have been meaning to go back to it – one part for nostalgia sake, but another part to give it another shot. I can easily see how two kids could have very different reactions to the movie. I liked it better than I remembered, maybe you will feel the same. My son was 7 when this movie came out. It was magical for him. He is now 40 and remembers it with fondness. All the characters come rushing back to him. The movie is something that we can share with our memories. I would love to get a copy of the book as it was in the movie but it’s a collector’s item and costs too much. If the book has that cover shown in the film, I can understand why it would be so expensive. Time marches on for all of us. Thanks for sharing a memory. It’s been a long time since I’ve seen this, but I remember really enjoying it. Wonderfully imaginative with its characters; but then, it pretty much had to be with its theme or it wouldn’t have worked. Very imaginative and very weird. I like the theme immensely.